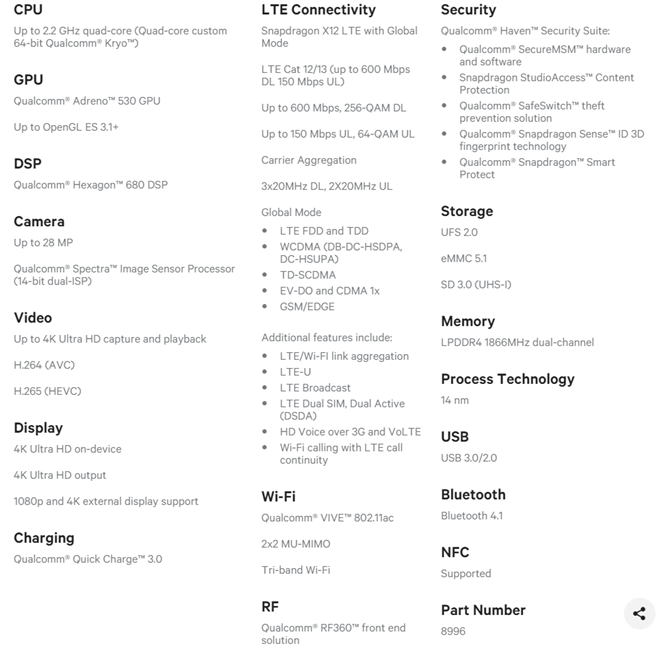 Qualcomm, one of the world's most renowned mobile chipset manufacturers, has just announced three new chipsets in its Snapdragon 600 and 400 tiers: the 653, 626, and 427. 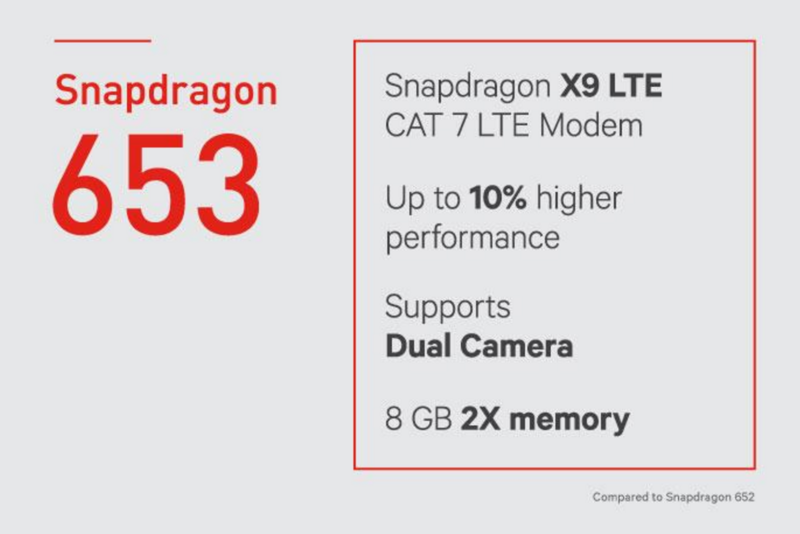 Sure, these aren't as exciting as a flagship 830 would be, but the mid-range market is huge for Qualcomm. The San Diego-based company has actually made some fairly interesting improvements with these new pieces of silicon. The 653, 626, and 427 all receive a new X9 LTE modem and support for Quick Charge 3.0 and dual cameras. This X9 LTE supports Cat 7 downlink speeds of up to 300MBps, and Cat 13 uplink speeds of up to 150Mbps (up to 50% better than the X8 LTE's uplink speeds). The Snapdragon 820 is far from a secret, but today marked the official "launch" of the upcoming chipset from Qualcomm in New York. The 820 is a huge bet for Qualcomm on the future of its high-end SoC business, marrying the latest technologies across the board for what it hopes will be the ultimate mobile processor. The 820's full specification sheet, such as it is, is below. The 820 will be manufactured on a 14nm FinFet process, sporting four brand-new Kryo CPU cores designed by Qualcomm. This marks a departure from the ARM reference cores Qualcomm has used exclusively on its 2015 lineup and which have arguably been a source of woe for the company this year. 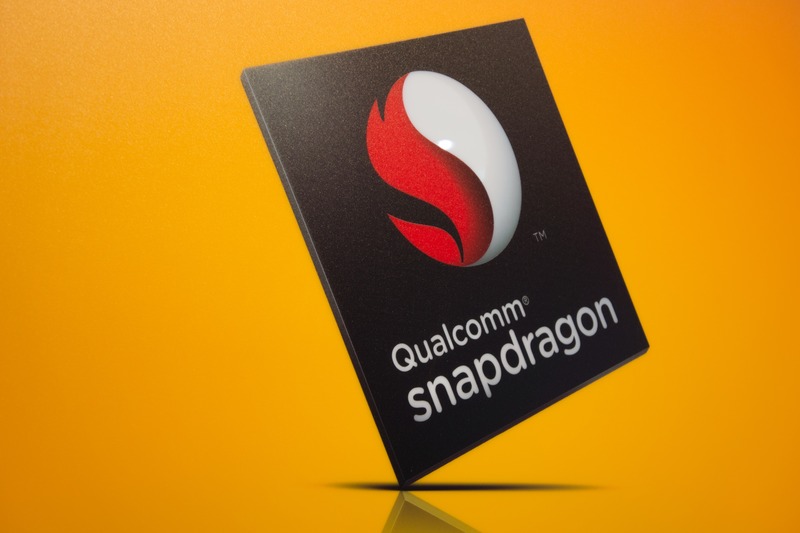 Editorial: Snapdragon Sorrows - Has Qualcomm Begun A Long, Slow Fall From The Top? Back in late July, the Qualcomm Corporation - employer of over 30,000 individuals at the time - began the process of telling about 15% of those people (eg, over 4,000 gainfully-employed human beings) they were no longer needed. This was after already cutting another 1500 jobs in late 2014. The company's stock is currently trading near 2-year lows, and while obviously still a very robust company, Qualcomm can't keep putting in these kinds of numbers if it's going to maintain its position at the tippy-top of the smartphone chipset market. Qualcomm (QCOM - NASDAQ) stock is down over 10% year-to-date. It is down over 20% from its peak, reached in early 2014. If you were hoping that the litigious nature of the consumer electronics industry would fade out any time soon, well, keep on hoping. 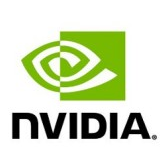 Today NVIDIA announced that it has initiated a suit against phone and tablet manufacturer Samsung and mobile chip supplier Qualcomm in the US District Court of Delaware for violating seven of its patents. The company is also petitioning the International Trade Commission to block shipments of Samsung devices using Adreno, Mali, or PowerVR graphical processing units. According to a blog post on NVIDIA's website, representatives approached Samsung to try and secure a patent licensing deal for the use of these seven patents. Time, like an ever-rolling stream, bears all outdated hardware away. Qualcomm is pretty eager to top itself when it comes to ARM architectures, and to that end has announced its latest high-end CPU and GPU chips set to fill future smartphones and tablets. 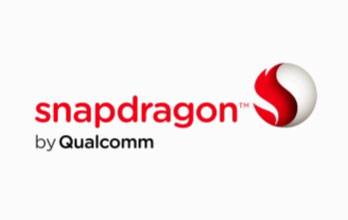 The Snapdragon 805 CPU and the new Adreno 420 GPU will be ready for mass-produced devices in the early half of 2014. So what has Qualcomm done to make this new system-on-a-chip shine? In the CPU front, the maximum clock speed per core has been bumped to an even speedier 2.5GHz, up from 2.3GHz on the current 800. If you thought the Snapdragon S4 Pro in the Droid DNA was snappy, get ready to redefine snappy. Not to be outdone by NVIDIA's Tegra 4 announcement yesterday, Qualcomm has detailed its own 2013 ARM chips. The S4, S3, etc. 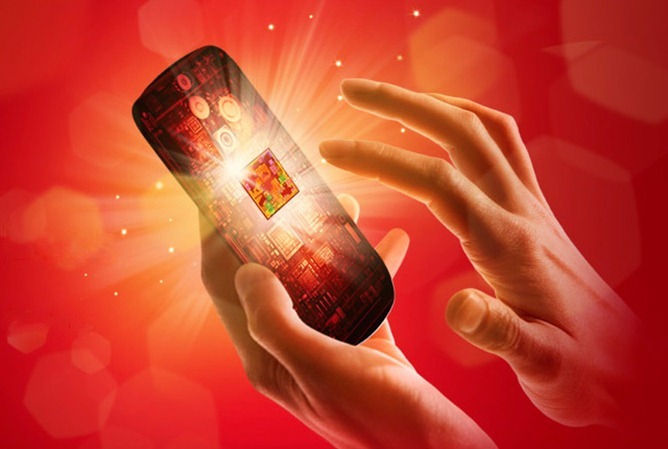 naming scheme is no more – the new chips are the Snapdragon 800, Snapdragon 600, Snapdragon 400 and Snapdragon 200. The 600 and 800 are the new high-performance processors in Qualcomm's lineup, and that's where the company is focusing most of its attention. The Snapdragon 600 will be running on four new Krait 300 cores (at clock speeds up to 1.9GHz), and should be able to deliver 40% more power than the S4 Pro while consuming less battery. If the latest iterations of the Snapdragon family have left you feeling hollow, lonely, and disappointed, we bring news to warm your MIPS-craving soul. In a move set to immediately banish the barely-available 45 nm MSM8260 from our minds, Qualcomm have just announced their Krait family. This series of 28 nm chipsets tops out at four 2.5 GHz CPU cores and a matching quartet of 3D processors, utilizing the latest in the Adreno GPU family. What kind of performance can you expect from these? Well, QC state that performance will jump by 150%, along with a 65% reduction in power consumption - and that's just the CPU.